Global Research Updates, which add to the Main DEM-DEC Bibliography (finalised on 24 June 2018), are issued during the first week of each month. The first monthly update, below, was issued on 6 August 2018, based on new publications and suggestions from users of DEM-DEC. All updates should be read in conjunction with the Main Bibliography. 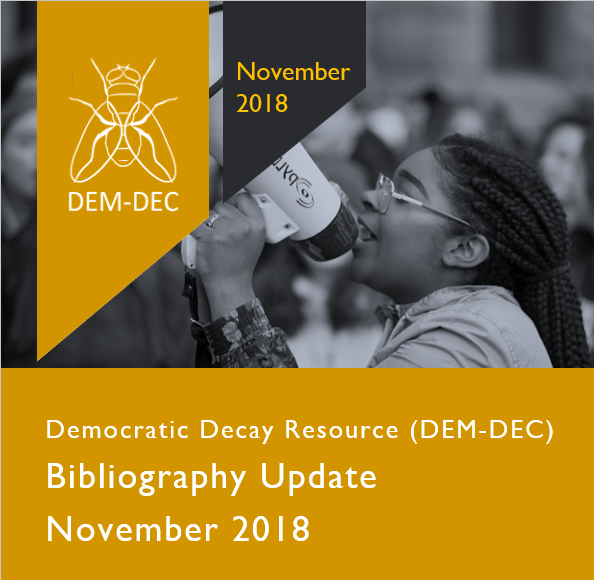 Don't forget: you can suggest additions for future updates by filling out the form on the Main Bibliography page, or e-mailing democraticdecay@gmail.com directly. The ninth monthly Global Research Update was issued on Thursday 11 April. It contains a raft of new academic research from March and early April 2019, a significant list of suggested additions from DEM-DEC users, an expanded list of forthcoming research, and a list of new resources added to the Links section. The eighth monthly Global Research Update was issued on Thursday 7 March. It contains a raft of new academic research from February and early March 2019, a significant list of suggested additions from DEM-DEC users, an expanded list of forthcoming research, and - in honour of International Women’s Day on 8 March, a list of recommended reads on far right and populism by female scholars. The seventh monthly Bibliography Update was issued on Wednesday 6 February. It contains a raft of new academic research from January 2019, a significant list of suggested additions from DEM-DEC users, an expanded list of forthcoming research, and details of the podcast of DEM-DEC’s launch panel: ‘Is Democracy Decaying Worldwide? And What Can We Do About It?’. CHECK OUT THE BIGGEST UPDATE YET! The sixth monthly Bibliography Update was issued on Monday 14 January. It contains a raft of new academic research from December 2018, a significant list of suggested additions from DEM-DEC users, a list of short texts on left-wing populism, an expanded list of forthcoming research, and details of the podcast of DEM-DEC’s launch panel: ‘Is Democracy Decaying Worldwide? And What Can We Do About It?’. The fifth monthly Bibliography Update was issued on Monday 3 December. It contains a raft of new academic research from November 2018, a significant list of suggested additions from DEM-DEC users, a list of short texts on left-wing populism, a list of forthcoming research, and details of the podcast of DEM-DEC’s launch panel: ‘Is Democracy Decaying Worldwide? And What Can We Do About It?’. The fourth monthly Bibliography Update was issued on Monday 5 November. It contains a raft of new academic research from October 2018, a significant list of suggested additions from DEM-DEC users, reading guides on populism and the radical right, and a list of forthcoming research. The third monthly Bibliography Update was issued on Monday 1 October. It contains a raft of new academic research from September 2018, key items from earlier in 2018 and late 2017, a list of forthcoming research, and a significant list of suggested additions from DEM-DEC users. CHECK OUT THE NEW DESIGN FOR UPDATES! This second monthly Bibliography update contains a raft of new academic research from August 2018, key items from earlier in 2018 and late 2017, a list of forthcoming research, and a significant list of suggested additions from DEM-DEC users. This first monthly Bibliography update contains a raft of new academic research from July 2018, key items from Jan.-June 2018, a list of forthcoming research, and suggested additions from DEM-DEC users.